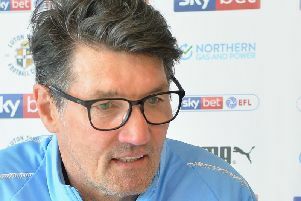 Town interim chief Mick Harford thought it was an ‘honourable’ stance from the club not to attempt to appoint a manager from another club during the transfer window. The Hatters themselves had their fingers burnt during January, with previous boss Nathan Jones leave for Stoke City just nine days into the month, potentially throwing their transfer plans into disarray. In the end, Luton still managed to sign George Moncur, Jason Cummings, Alex Baptiste and Aaron Connolly, thanks largely to Harford’s role as head of recruitment, giving themselves plenty of options for the run-in. Bury boss Ryan Lowe has been a long-term favourite for the job with SkyBet, along with Motherwell chief and ex-Hatter Steve Robinson, but Harford felt it was right to not try and weaken another club with the window still open. He said: “I think it’s very honourable to do that in terms of, if we’re are looking to bring a person in from a football club, I think it’s a really, really sensitive time to take someone away from a club when the window’s still open. Harford, who has now taken five matches, winning 10 points from 12 in the league, once again reiterated his desire to return to his recruitment position once a new manager is appointed. However, he is happy to continue in temporary charge for however long he is asked, adding: "If I’m asked to do the job, I’ll do the job. "As long as the football club want me to do it, as long as I’m doing the job to help the club, that’s all I’m here for. “I’m not the long term fix for Luton Town manager, we’re in the process of finding a new manager, but I’ll carry on if they want me to carry on.